Synthetic peptide within Human Glucagon aa 50-150 (N terminal). The exact sequence is proprietary. Our Abpromise guarantee covers the use of ab92517 in the following tested applications. WB 1/1000 - 1/10000. Predicted molecular weight: 21 kDa. IHC-P 1/8000. Perform heat mediated antigen retrieval before commencing with IHC staining protocol. Immunohistochemistry (Frozen sections) - Anti-Glucagon antibody [EP3070] (ab92517)This image is courtesy of an anonymous Abreview. 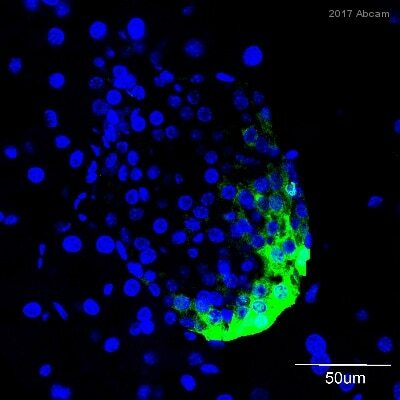 Frozen mouse pancreas tissue stained for Glucagon (green) using ab92517 at 1/100 dilution in immunohistochemical analysis, followed by Donkey anti-rabbit IgG Alexa Fluor­ 488. 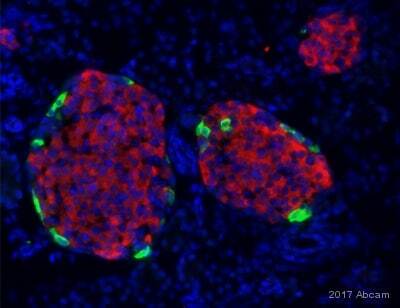 Insulin (red), counterstained with DAPI (blue). Immunohistochemistry (Formalin/PFA-fixed paraffin-embedded sections) - Anti-Glucagon antibody [EP3070] (ab92517)Image from Oelze M et al., PLoS One. 2014;9(11):e112394. Fig 1.; doi: 10.1371/journal.pone.0112394. Glucagon measurements in controls and diabetic rats 8 weeks after STZ injection and 7 weeks of SGLT2i (low and high dose) treatment. Representative immunohistochemical stainings of pancreatic tissue. Immunohistochemistry (Formalin/PFA-fixed paraffin-embedded sections) - Anti-Glucagon antibody [EP3070] (ab92517)Image is courtesy of an anonymous AbReview. Immunohistochemical analysis of PFA-fixed paraffin-embedded murine pancreatic tissue sections, labelling glucagon with unpurified ab92517 at a dilution of 1/2500 incubated for 18 hours at 4°C. Antigen retrival was performed through heat-mediated 10mM sodium citrate pH 6.0 incubation. Blocking was done with 5% serum for 1 hour at 25°C. The secondary was a donkey anti-rabbit polyclonal Alexa Fluor® 488 conjugate at 1/400. Counterstaining is with DAPI (blue) against nuclear DNA. 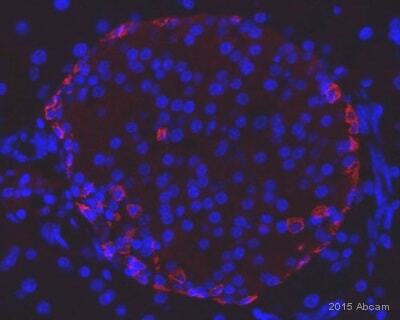 Unpurified ab92517, at 1/1000 dilution, staining Glucagon in paraffin embedded Human pancreas tissue by Immunohistochemistry. Publishing research using ab92517? Please let us know so that we can cite the reference in this datasheet.